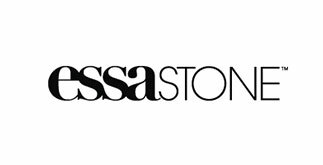 Stone Benchtop Caesarstone, Quantum Quartz, Essastone, Silestone, Smartstone, Stone Ambassador, Stone Italiana, Trendstone, Technistone, Cambria. 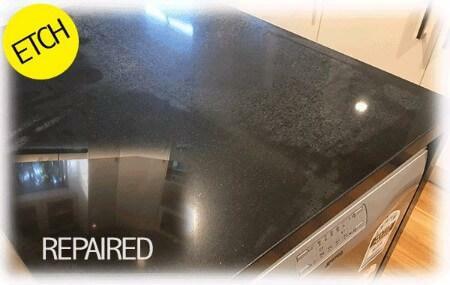 How to clean Caesarstone stains or NOT! 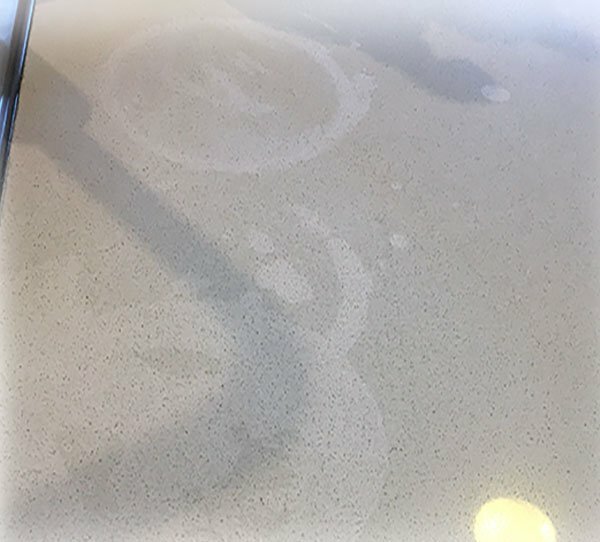 Dull Caesarstone polish generally is only one of two issues. 1) Buildup of chemicals caused by most common spray cleaners, soap and water or just cleaning with a cloth. Subsequently all DO NOT clean the surface or decontaminate the stone benchtop surface. For example it is more common on matte or honed finishes. 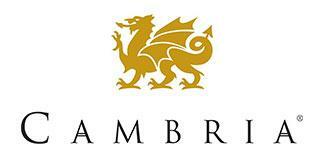 Though will occur on any surface finish, polished, honed or matte. 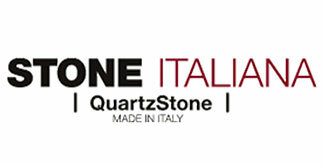 Granite, Marble, Quartz, Caesarstone or any similar brands. 2) in fact is damage to the surface polish, matte or honed finish. Hence the surface has been ETCHED by a chemical or an abrasive. 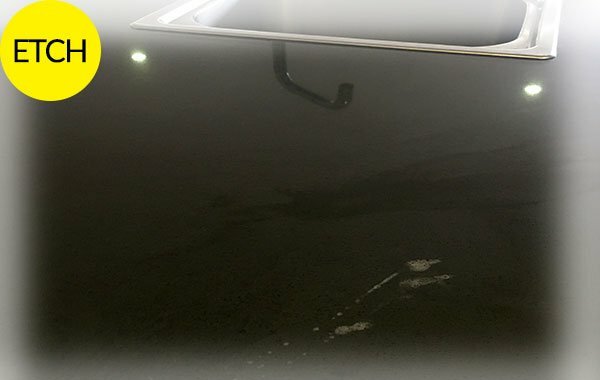 Jif, Gumption, vinegar, bleach, acetone, solvents, oven cleaner, drain cleaner and glass cleaners are all know causes of etching or dull spots on any stone. NOTE: No quartz has a sealer applied or any other coating applied to the surface. All stone is finished by the factory with the use of special in line slab polishers. 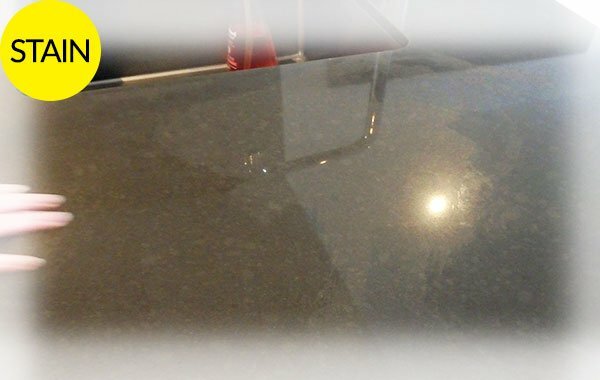 If for some reason you have a dull caesarstone polish, matte caesarstone, marble look stone benchtop, watermarks as per the photo below. Hazy or a spot that looks like the polish has been removed. Most likely it will be the cleaning agents you are using. 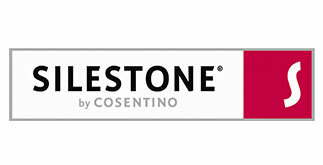 Dull caesarstone polish is from a build up of contaminants and caustic compounds contained in most off the shelf stone cleaners. 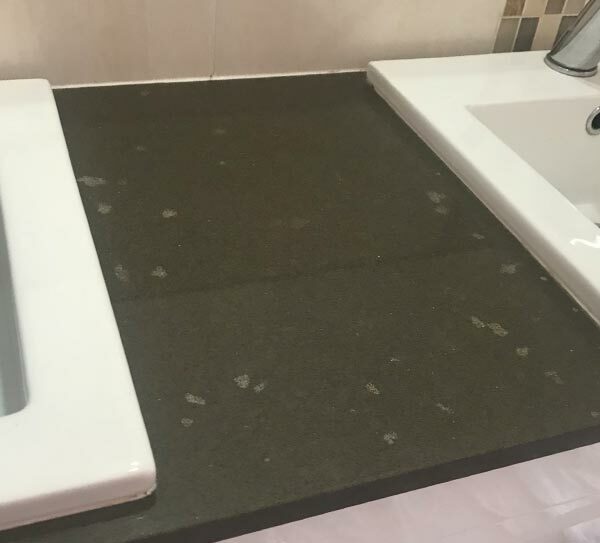 Or if you have Dr. Google the issue it may be damage to the stone from a cleaning product or method used for trying to remove a stone benchtop stain. 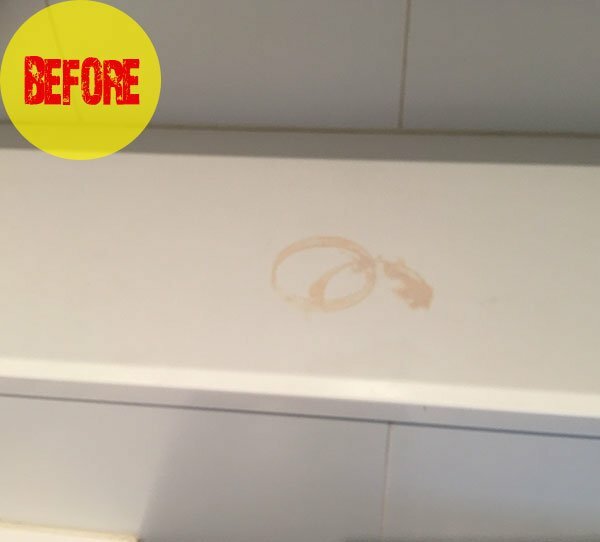 Contact us with some photos, a description of the issue and what you have used to try and remove the stains. 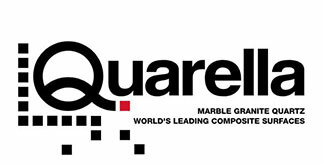 New Marble look stone benchtops including caesarstone and also matte ranges from Silestone, Caesarstone and Granite. Require some additional care that NO cleaning products that contain bleach, sodium salts or surfactants are used. 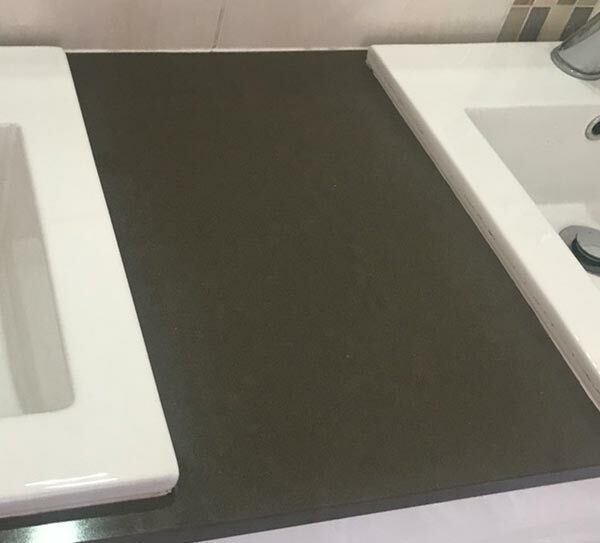 Subsequently any cleaning products outside the pH range of 6-8 WILL DAMAGE the polish, shine and cause dull caesarstone polish even on matte surfaces. 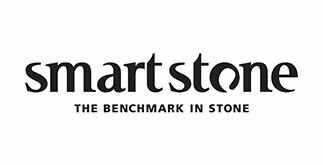 Most of the off the shelf cleaning products and including ones offered by the likes of Caesarstone WILL DAMAGE and void the warranty on all stone as they are highly caustic and corrosive. We highly recommend only using either methylated spirits and water or a specially designed cleaning spray and wipe for everyday use; such as Stone Power Cleaner. 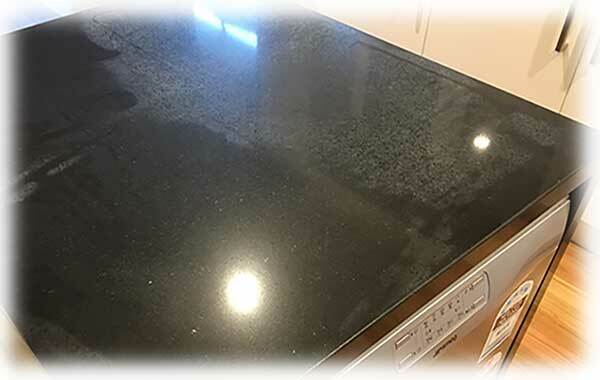 Fingerprinting, smudge marks, streaking and water staining to any stone benchtop is due to the wrong cleaning products being used. Again if you use Stone Power Cleaner these issues will not be a problem on any surface including glass, 2 pac cabinet doors and perfectly cleans stainless steel. Leaving a streak free, perfect shine and fingerprint free surface. Stone Power Cleaner as for all Stone Guys cleaning products actually decontaminate the surface with the added bonus it is all natural and pH neutral. 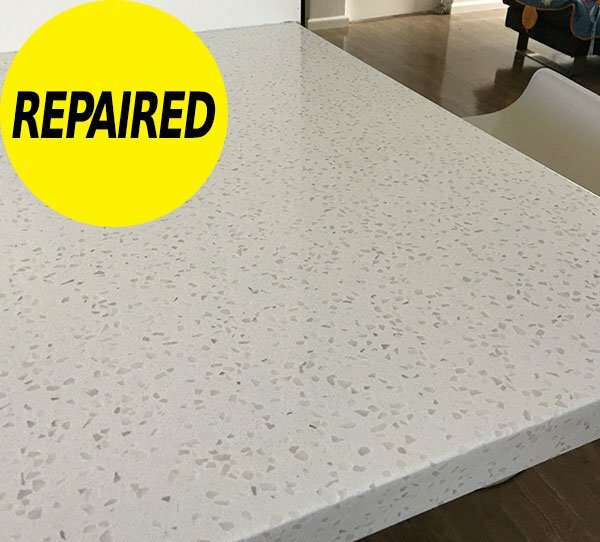 Stone guys, stone benchtop Stain repair are done using the latest knowledge and technology ensuring that a near perfect match is achieve by using the components the stone is originally made from. Why our proved technology does not use sealers. 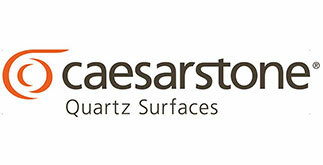 Hence returning the surface back to the durability and finish of the original caesarstone. 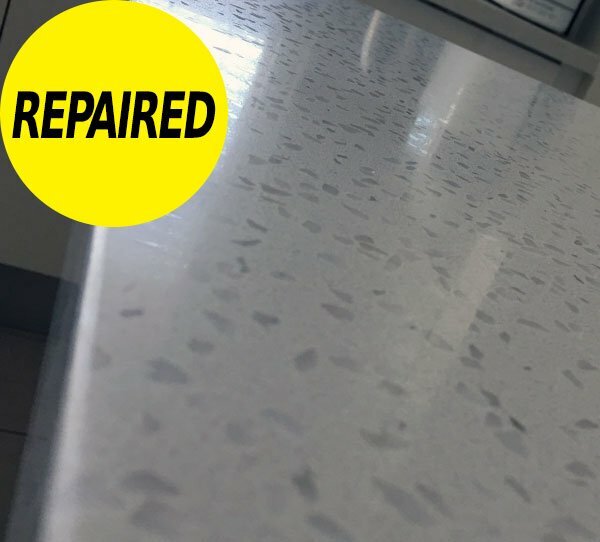 Resulting in a stone benchtop Crack repair that is near to perfection. Below the results speak for themselves. 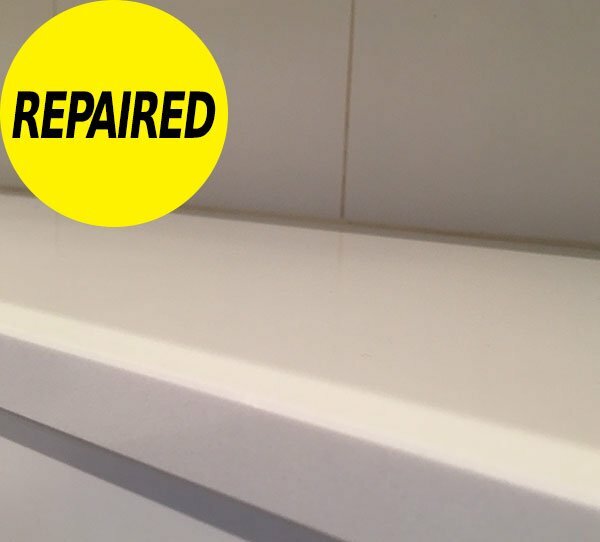 Stone Guys, stone benchtop etch repairs are NOT a band aid solution to a very major problem. 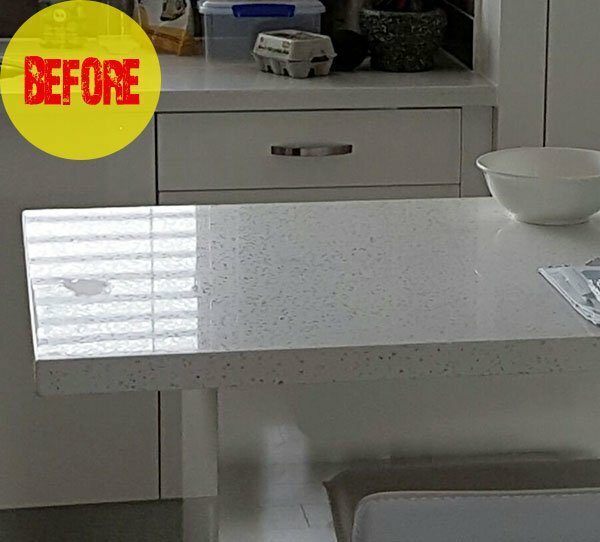 Caesarstone Polish or Dull spot repair process is similar to all our repairs has been developed over 30 years giving a near perfect result. 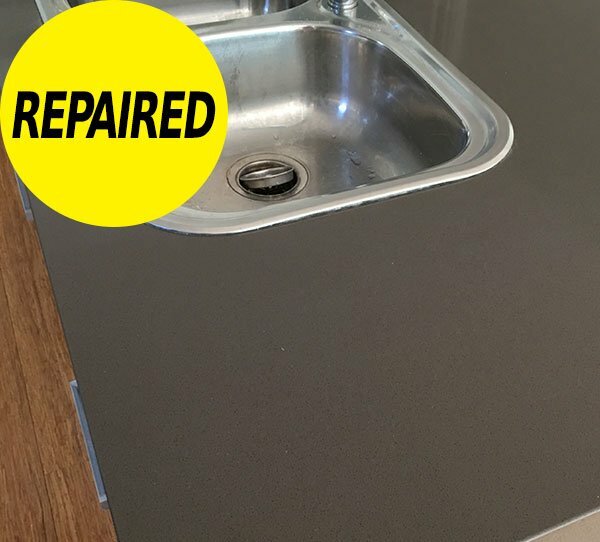 WHEN IS DULL CAESARSTONE DAMAGED? Conquencidental you may have found yourself looking for information on cleaning caesarstone stains. As a result have a etch or damaged the surface. 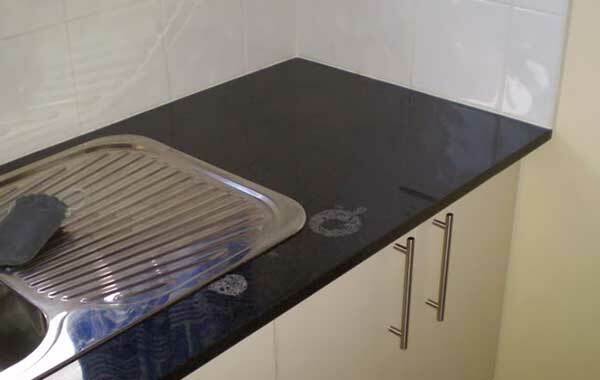 Stone Guys are able to repair the damage area without the need to replace the stone benchtop. 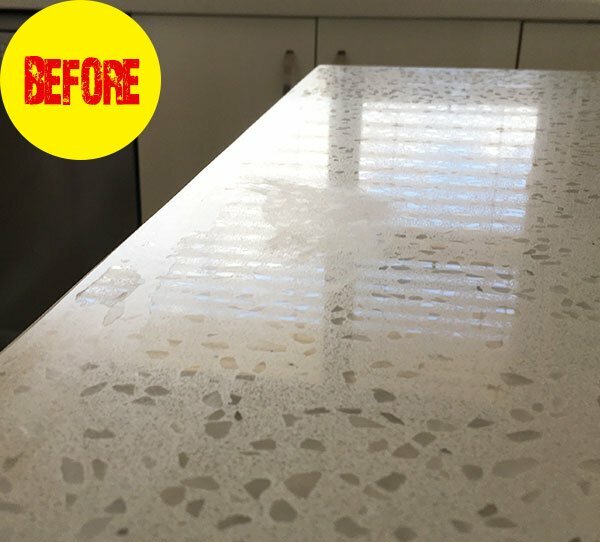 Bleach, jiff, magic erasers, spray and wipe, high pH cleaners (most off the supermarket and bunnings) WILL DAMAGE any stone over time. 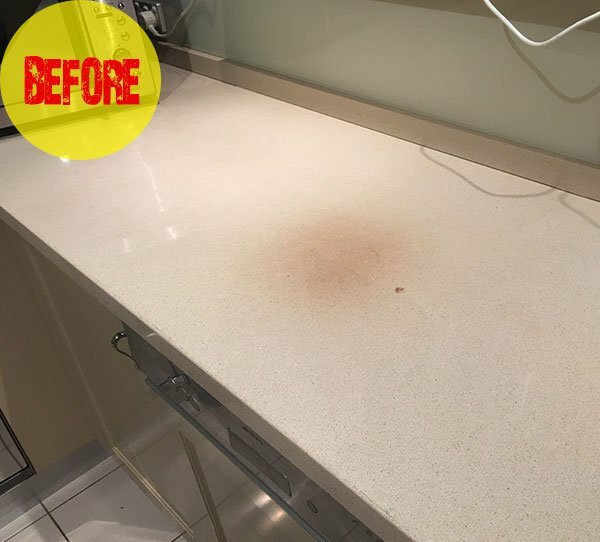 Yellow staining to light coloured stone benchtops or quartz subsequently enhanced by most common spray and wipe cleaning products. Over time the surface will become yellow or a faint brown. Due to the surface being attacked by high pH cleaners examples of which contain sodium salt, soaps and surfactants. Stone Guys are able to repair this type of damage. Even after years of abuse and neglect specially formulated to remove yellow stains. 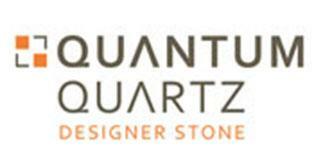 Especially on Caesarstone, Silestone, Cambria or any other quartz brand. Below at the bottom of the page is an example of yellowing or sometime referred to as UV damage. Stone Guys stone benchtop repairs have always been at the forefront of the stone industry. Using time old techniques, attention to detail coupled with modern technology developed inhouse. 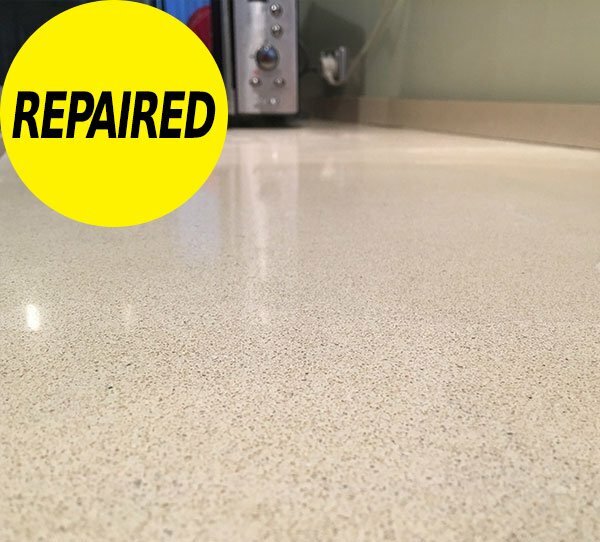 Enables the best repairs for your stone benchtop, no fuss and near perfection every time. The longer a stain sits on any stone the harder it is to remove. Rust is one of the hardest stains to remove and generally if it has been there for months. It will require overnight use of Gloss Renew and Stone Power Cleaner to remove the rust completely. Above the photo actual damage NOT stains, from heat (round marks) and chemical etching damage from bleach and cream cleansers. 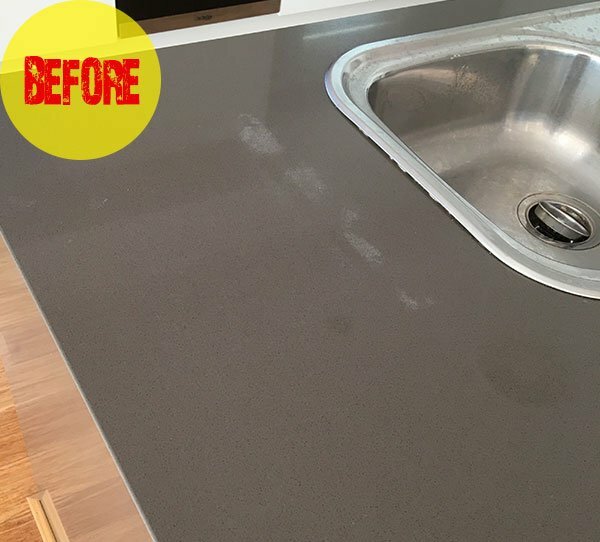 NO cleaning products or google methods including sealers will fix damage to a stone benchtop. It will have to be be professionally repaired by Stone Guys.